For a while I’ve been wanting to do a project that used black iron pipe for the main structure. Kind of a Lego’ish appeal for grown ups, if such a thing is possible. It’s strong and not hard to work with as long as you can stick to the stock lengths (you can cut it or have it cut, and then thread it if you really need something custom). The biggest headache is that the pipe has some kind of light grease applied liberally. If you don’t take it off first you will get dirty. If you do take it off some pieces stay black, others are closer to a stone washed look – both work for the retro/industrial look without any further finish. A good sized pipe wrench will come in handy, either as you try to turn it the last little bit to line it up or to undo a part that didn’t work out the way you wanted. Lowes (in my area at least) sells a decent selection of lengths and fittings. It looks inexpensive, but it can add up quickly, even for a small project like the table below. For example the flanges (the feet in the picture) are about $5 each. I ended up ordering from SupplyHouse.com for most of the fittings and bought the bigger pieces at Lowes. It’s all half inch pipe. It was around $75 for this project. The table is about 14” wide and 48” long, with the lower shelf being about 24” long, though as you can see less is usable – but still plenty of room for a cable box/DVR and something else on top of it. The wood is ambrosia maple, about $9 a board foot. The “ambrosia” means an ambrosia beetle got into the wood and brought with it the fungus that causes the dark stripes. It was just over 5/4” (1.25”) rough sawn and I planed it by hand, in part because it was too wide for my 12” planer and in part to work on my hand tool skills. The finish is wipe on polyurethane and then some wax, no oil or stain. It’s sturdy and doesn’t seem to want to tip, that lower cross bar moves the center of gravity down some. The one error you can’t see is that I didn’t plan for enough overhang on the back so that the top would sit flush with the wall. The wood trim on the base of the wall ends up causing a small gap at the top. It’s not a complicated project and could be made simpler by removing the lower shelf and/or cheaper by using stock lumber (nominal 2” pine would work fine, don’t use the 1” for the 48” span). It was enough fun that I’m working on an idea for a small writing desk as my next project. That’s awesome! 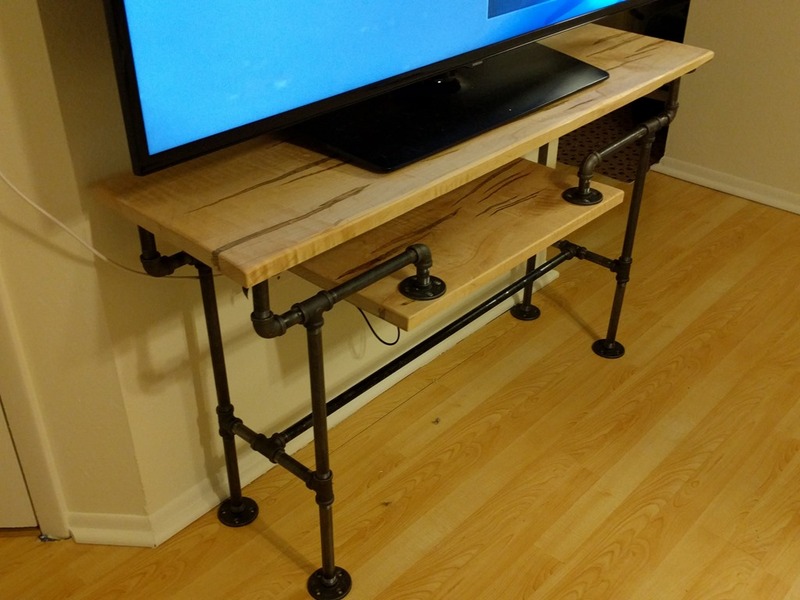 I’ve been wanting to do an iron pipe project myself, but haven’t come up with an affordable idea yet. You’re right, those pipe pieces add up fast. Thanks for the Supply House link, I’m going to check them out. I love ambrosia maple, I just finished a 6 foot long bench with an ambrosia maple top. You mentioned you hand planed it, did you have an electric hand planer or did you go old school and use a manual one? I don’t have a planer yet, but if I’m going to be working with ambrosia maple much more, that’s probably going to be my next big tool purchase. I forgot to mention SupplyHouse has two different vendors for the fittings – use the imported ones, worked fine for me! Hand planed it was. I’ve been watching Paul Sellers on Youtube and realized I’m never built up the hand tool skills I should have, so I try to do some part of each project with hand tools. Planing wasn’t bad, sharpening still a weak spot, ambrosia was tough to plane and avoid tearout. Good exercise too!